Senators Liz Mathis and Amanda Ragan at a Medicaid Oversight Committee Meeting. DES MOINES — Four key Democratic state legislators today denounced plans by officials with Governor Kim Reynolds’s Administration to have a closed-door meeting to discuss the failed Medicaid privatization experiment. 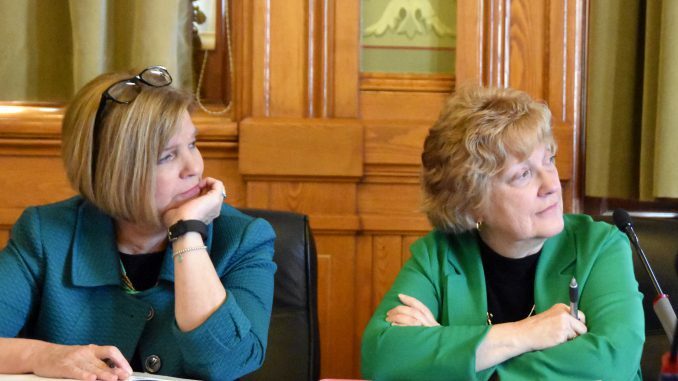 The four legislators – Senators Amanda Ragan and Liz Mathis and Representatives Lisa Heddens and Beth Wessel-Kroeschell – were reacting to plans by Iowa Medicaid Director Michael Randol to hold a closed-door meeting with Medicaid providers on Thursday, February 22. The stated purpose of the meeting is to identify and discuss payment issues that Iowa health care providers are having with privatized Medicaid. “This meeting should be open to the public because problems with Medicaid affect all Iowa taxpayers, more than 600,000 Medicaid members and healthcare providers across the state. “Hundreds of hospitals, nursing homes and other Iowa healthcare providers face financial jeopardy because of Medicaid privatization. This issue affects Iowans in every county. Requests by legislators to attend the meeting have been denied. The four legislators also renewed their concerns about a proposal by the Reynolds Administration to eliminate much of the oversight for the privatized Medicaid program. Sen. Ragan and Rep. Heddens are ranking members of their respective Health and Human Services Appropriations subcommittees, and Sen. Mathis and Rep. Beth Wessel-Kroeschell are ranking members of their respective Human Resources committees.